3G FCAW welding certification coupons in place ready to be inspect by Certified Welding Inspector. 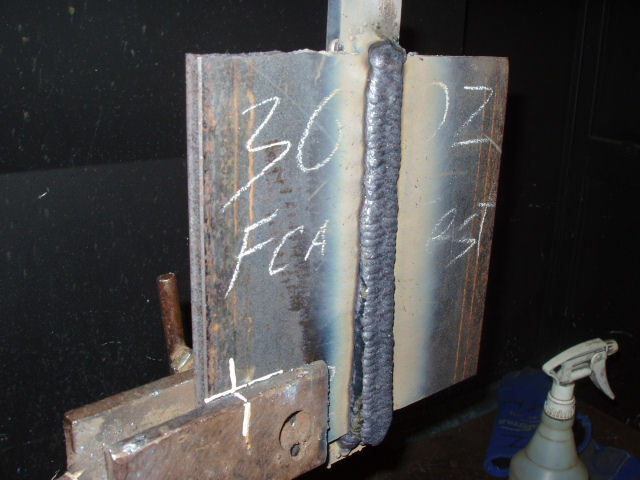 3G FCAW Welding Certification Overview. This page is about how to pass a 3G flux cored arc Welding certification. Just like my other welding certifications I wrote down all of the detail on how to pass this welding certification and took pictures to illustrate the procedure. structure during cooling. See explanation below. 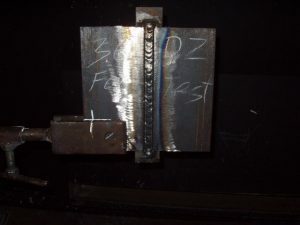 This is a very easy welding certification to pass as long as the welding machine is set right. I literally have not picked up flux cored welding wire since 1996 and it took about ten minutes of practice before I took this welding certification. If you can Stick and MIG weld, then flux cored welding should not be a problem for you. As easy as this test is I did fail it the first time. So this is the second time I am taking this welding certification. 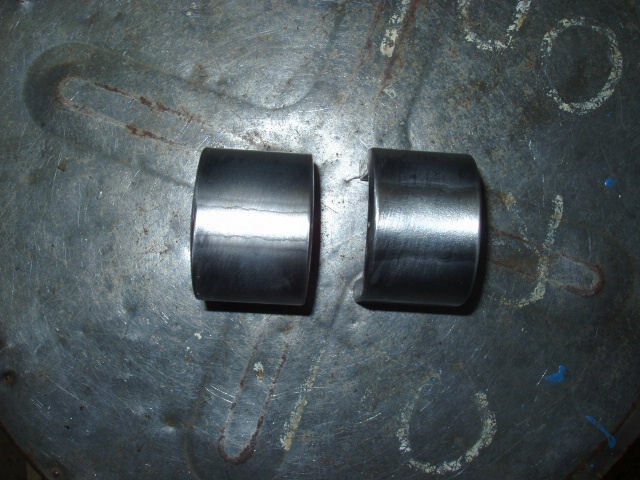 The failure of the first 3G certification was not caused by any weld defects. 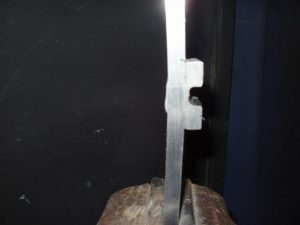 The weld held up fine but what happened was the test coupons broke about 1/8 of an inch outside of the weld area. At the time I was taking the test many other welders were failing their welding certifications for the same reason. What we all had in common was, when taking our welding certifications our test coupons were too close to the exhaust vents. Failing a welding certification that costs only $20 was not a big deal to me, but the fact I had to do it again got me thinking. When I went home I pulled out my metallurgy book and started looking for an explanation. The most likely cause for this type of coupon failure seems to be coming from the “Heat Affected Zone". I don’t know if what I am about to mention is completely true. Remember I am not a metallurgist or a welding engineer. I am just a welder and this is just a theory! Since all of the welding certifications that failed were too close to the vents in the welding booths and none of them broke in the weld area. I believe that the cause was coming from the test plates cooling too fast. The area where the test coupons failed is also where the metal is known for forming a coarse grain structure, causing that area to harden. 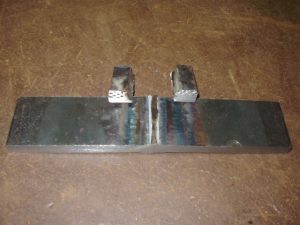 Since that time, nobody at the school has tested with their test plates to close to the exhaust vets, and since that change, no one has had this type of coupon failure! The pictures I am posting are going to be mixed up between the first and the second test. When I did this certification the first time, I took a lot of pictures showing how to prepare the test coupons, and how to remove a backing bar. Outside of preparing the test coupons and removing the backing bar all of the other pictures are from the test I passed. Who Should Take a 3G FCAW Certification? 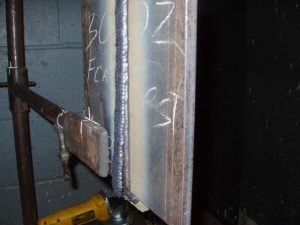 Flux cored arc welding is typically used when there is a lot of welding to do and it is out doors. 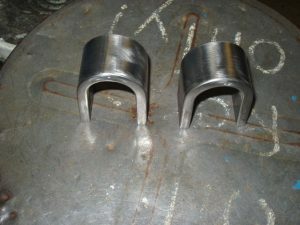 FCAW is used in industrial shutdowns for welding of boilers and pretty much any industrial construction projects that need high quality welds fast. 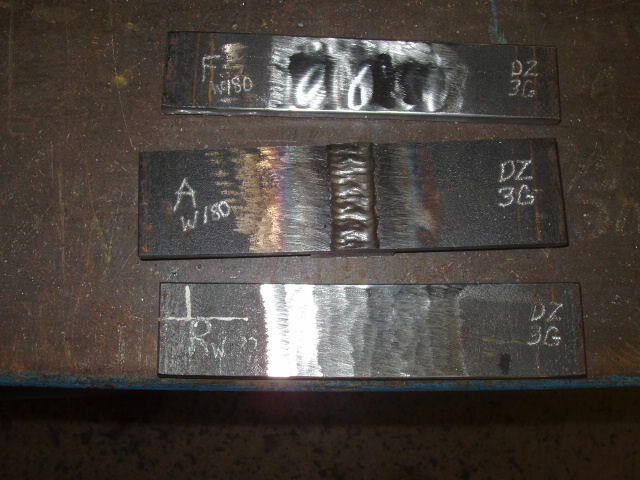 For certain jobs having a 3G flux cored arc welding certification will get you in the door before someone who does not. It may also help in getting a structural welding job in a shipyard. 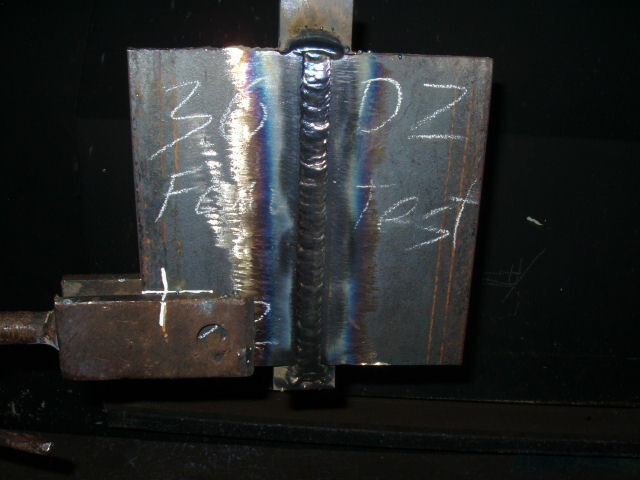 I do want to mention that if you are going to test at a shipyard, you will also need to pass a 4G welding certification. The standard shipyard qualification test for structural flux cored arc welders is a 2G, 3G, and 4G, 1 inch thick plate test, with a ceramic backing tape. So if you are going to test for a shipyard, make sure you can pass their tests! The specifications for this welding procedure are very simple compared to my other welding certifications. 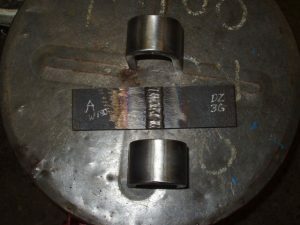 The AWS D1.1 3G FCAW procedure qualifies you to weld in the 1F, 2F, and 3F positions and the 1G, 2G, and 3G positions. You are qualified to weld in the flat, horizontal, and vertical positions and not the 4G or overhead position. 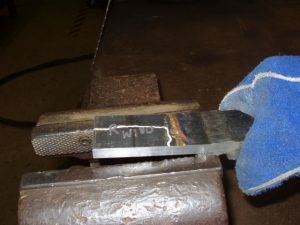 This welding certification I passed is the limited thickness procedure that qualifies me to weld carbon steel from 1/8 to ¾ of an inch thick plate. The welding certification is just like any other AWS welding certification when it comes to expiring. 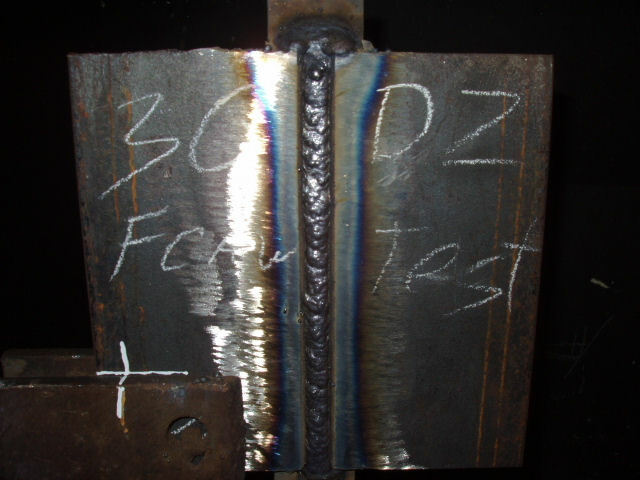 If you do not weld using the FCAW process, this welding certification expires in six months, or 180 from the time the test was taken. Every six months an employer or a welding school needs to sign the welding log in the back of the certification to keep it up to date. 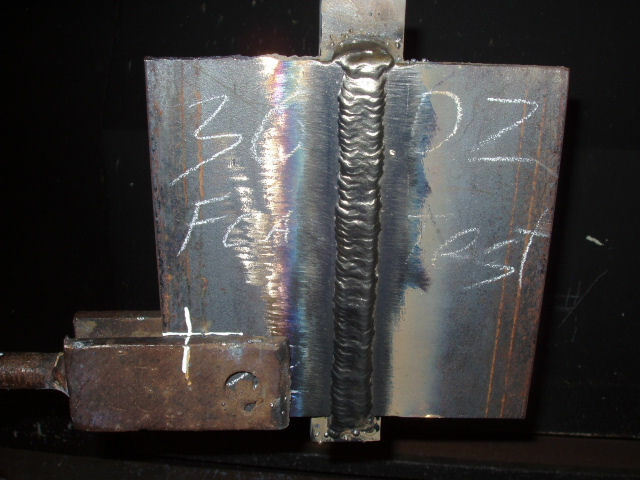 If you are not working simply take a refresher course at a local welding school to keep the welding certification up to date. Setting up of the flux cored welder was not hard. 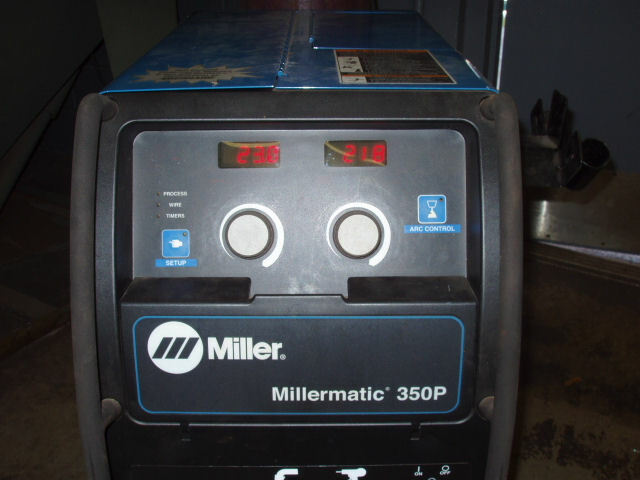 I used the same Millermatic 350P that I did my 3G vertical up MIG welding certification with. All I did was change the wire from MIG wire, to flux cored E71T-1 dual shielding wire, and then the rollers. The bottle of gas on the machine was already C25 gas. 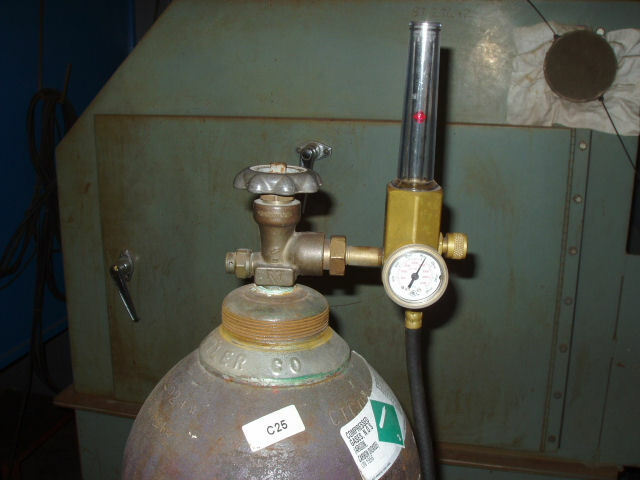 The gas flow rate the procedure specifies is 40 to 50 CFH but I only used about 30 CFH. I am welding indoors, inside of a welding booth, with no real drafts, so my gas coverage was more than enough. Millermatic 350P MIG Welder using FCAW Dual Shield FCAW wire. The settings I used were 23 volts and my wire speed was at 218 IPM (inches per minute). I don’t remember the exact amperage but those settings on most machines should put you into the proper range for vertical up welding. Remember each machine is different; even if you are using the same make and model, the settings will vary depend on how the machine is calibrated. When welding the sound had a fast deep crackle to it. 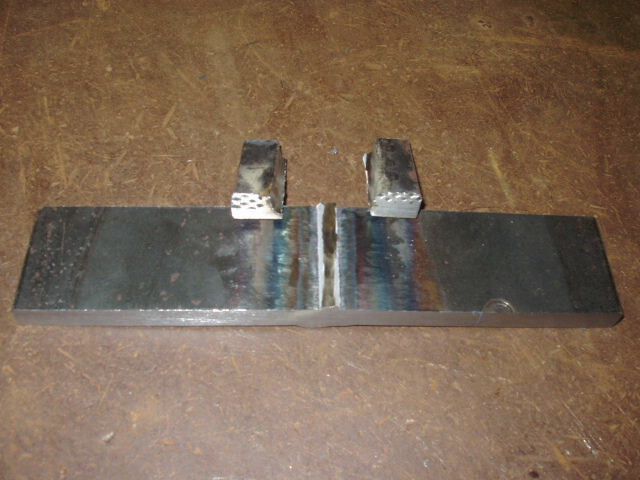 With flux cored arc welding there are two types of wire transfer. Globular and spray transfer. True spray transfer has just a hissing sound to it, otherwise when the amperage crosses a certain threshold the weld crackles but it is spray transferring to the joint. This is especially true with flux cored welding! The test coupon preparation is the same as all of my other 3G welding certifications. In this 3G welding procedure the notes are taken from the same section of the AWS code that are used for the 3/8 inch limited thickness test procedure. 3G FCAW test coupons ground. I received my test coupons that were pre-cut and ready to prepare. 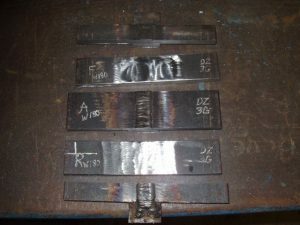 All I did was grind the face of the test plates a minimum of one inch back from the bevel and a minimum of a quarter of an inch back on the back of the bevel. Next I cleaned the backing bar to bare metal with a grinder. And then cleaned the oxidation off of the bevel to bare metal. Checking the bevel on the test coupons to make sure they are 37.5 degrees. 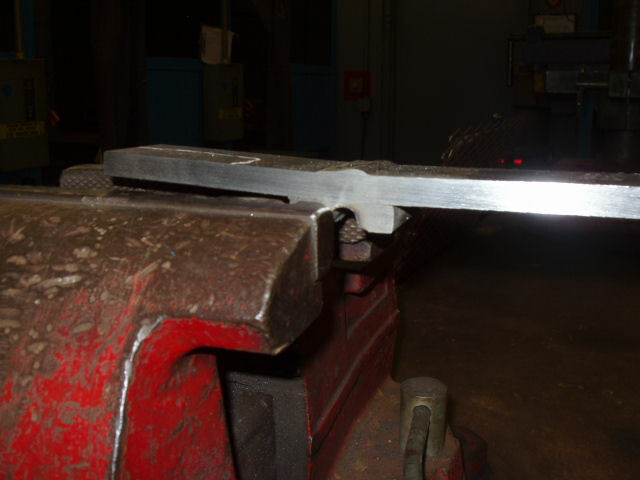 After that the bevel angles were checked with a protractor by myself, then the welding instructor rechecked them. Everything was good and then I tacked up my coupons. I set to root opening with two 1/8 inch welding electrodes and then the test plate was inspected for fit-up. 3G FCAW welding certification coupons in place ready to inspect by Certified Welding Inspector. .
3G FCAW Root Pass with Slag Covering. 3G FCAW Root Pass with Slag Cleaned. Before welding the hot pass I did let the plate cool to the point that I could almost touch it. The hot pass was done using the same technique as the root pass. All I did was just use a steady side to side weave with-out pausing too much on the sides. I did the fill in a single pass and had no restarts. With flux cored welding the wire does most of the work. It is such an easy process to use and takes very little skill. All I did to clean the slag was use a wire wheel and the weld was cleaned. 3G FCAW Hot Pass Covered in Slag. 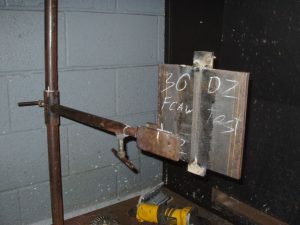 The first picture below is the weld still covered in slag. The second picture is the slag lifting itself off of the cap. 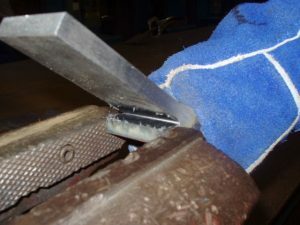 What I like about flux cored arc welding is how easy the weld is to clean and in many times the slag just falls off by itself. The last picture is the cap cleaned with a wire brush. 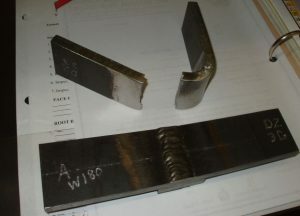 3G FCAW Cap Weld with Slag Covering. 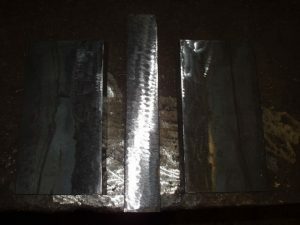 3G FCAW Cap Weld with Slag Peeling. 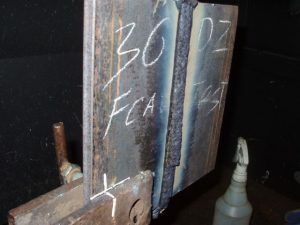 3G FCAW Welding Certification Test Marked for Face, Root and Alternative Bend Test Coupons. The test coupons were prepared just like my other welding certifications. First you mark a center-line on the plate. Then another line 1 inch above the center line and another line 1 inch below the center line. This is the section that can be used as an alternate coupon in the event of corner cracks with no evidence of slag inclusions. Next is marking of the actual root and face bend specimens. Using the top and bottom line, mark another line a minimum of 1 ½ inches above the top line, and then 1 ½ inches below the bottom line. The minimum width of a test specimen needs to be 1 ½ inches wide. Otherwise that test specimen will fail on the spot! 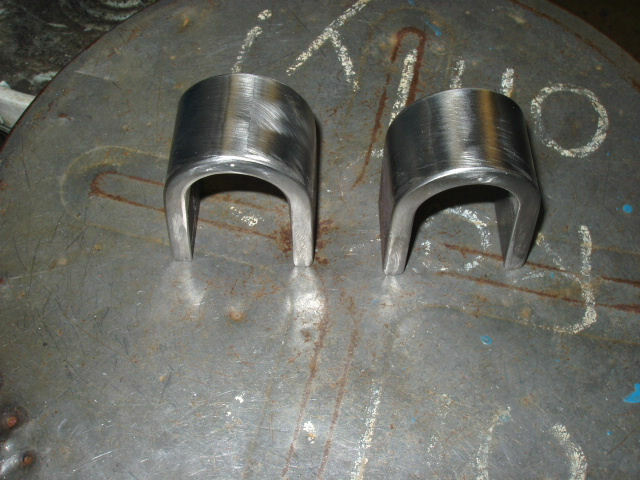 After that they were marked by the welding instructor for a root and face bend followed by me cutting them on a band saw. 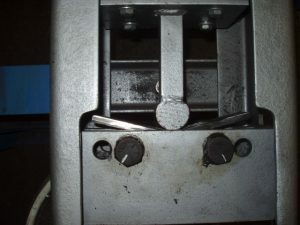 The backing bar removal was mostly done using a vice. First I put the coupon into the vice and took a grinder to the center of the backing bar gouging it. 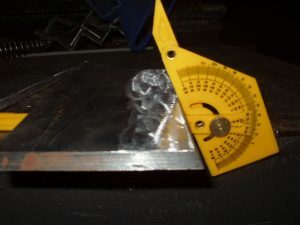 I kept grinding out the center till I was about 1/16" or so away from the back of the test plate. Next I locked onto one side if the split backing bar with the vice firmly. After that all I had to do was press down on it like a lever. I kept repeating this until all of the backing bars were removed on the test coupons. 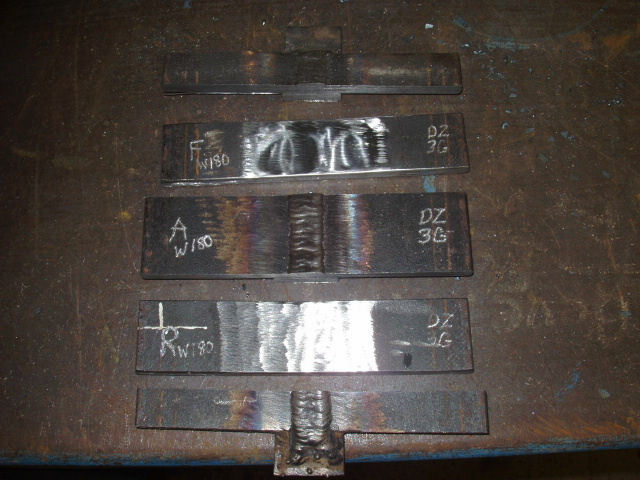 The pictures below are from the first welding certification that I failed. I am posting them because they give a good illustration of how to remove a backing bar. Gouging the center of the backing bar where the weld penetrated with a grinder. 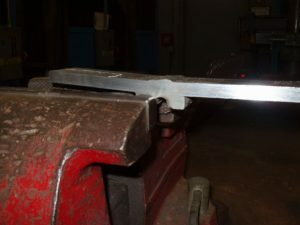 Grabbing and locking one side of the backing bar with a vice. Once the backing bar is secure grab it firmly. Once you have a solid grip then press down until the backing bar starts to bend from the coupons. Once you press it all the way down it should break free. Finally the backing bar is removed and you can see the two pieces that are left. 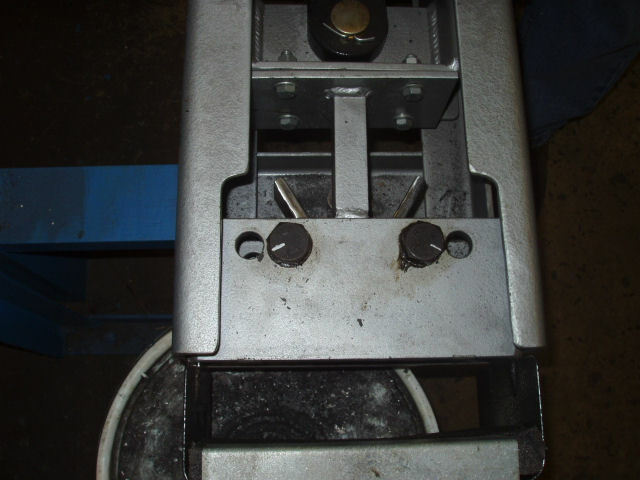 After the backing bar is removed, the face and the root of the weld need to be ground flush to the base metal. 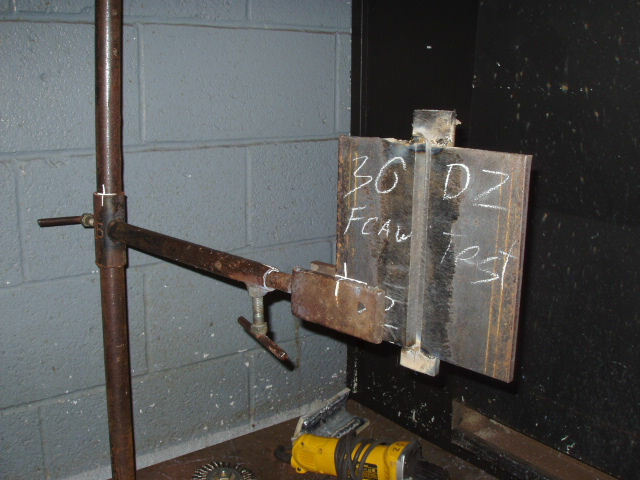 If you grind past the base metal the test will be rejected for excessive material removal. 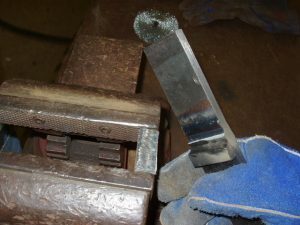 After grinding down the root and face of the weld, I used a belt sander to round the square corners, followed by a buffing wheel to polish the weld area. The Welding Certification test coupons are now ready to bend. This is a face bend, root bend and alternative coupon that will be tested. The face and root coupons. The alternative is not ground becuse we don’t know if we will need it. The bend test went very well on these coupons. If you remember I took this test before and the test coupons failed before the weld area got a chance to bend all the way. On this test I had two bends done, a root bend, and a face bend. Below are pictures of the test specimens being bent. The first coupon starting to bend. The coupon looks good as it is more then half way through the bend test. Both coupons were bent and I did not need the alternate. The results were flawless and this is how I passed the AWS D1.1 FCAW 3G Welding Certification! 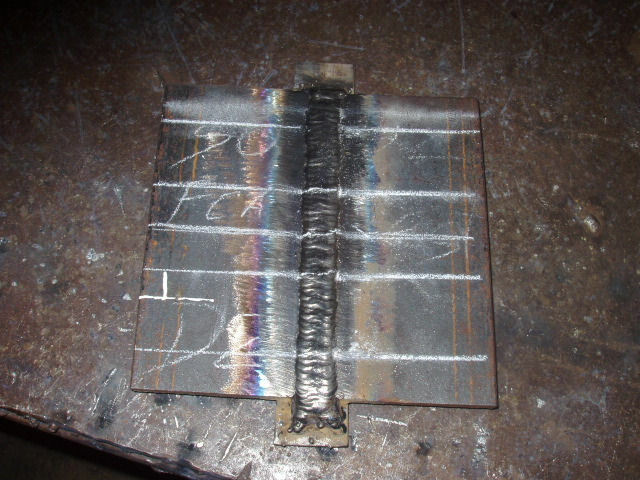 The root and face bend of the welding certification look flawless.